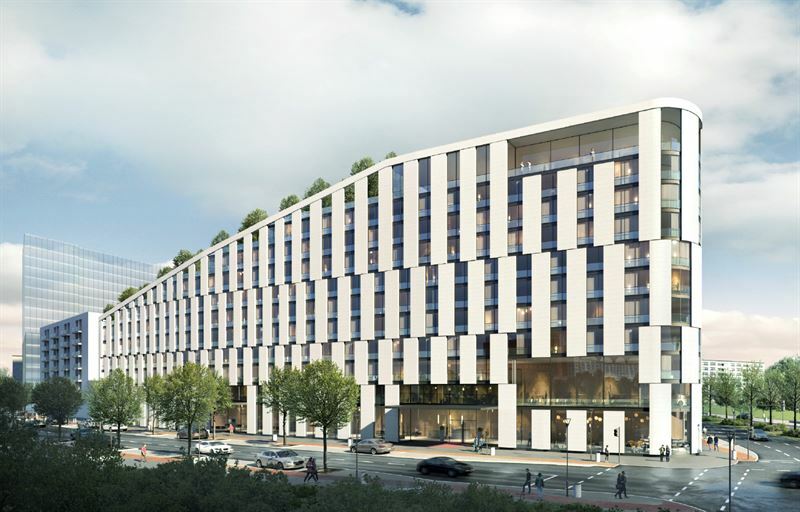 Scandic Hotels, the largest hotel company in the Nordic countries, has signed a long-term lease agreement with developer B&L Group regarding the operation of a new hotel in Frankfurt. The conference and event hotel will be part of the new “Hafenpark Quarter”, a mixed-use development on the banks of the Main river, close to the city center and next to the new headquarters of the European Central Bank (ECB). It is expected to open in 2021. The hotel will encompass 22,000 m2 and have 506 rooms and 2,000 m2 of state of the art conference and event space. Scandic Frankfurt Hafenpark will also offer an attractive restaurant and bar, excellent modern fitness facilities as well as one of the largest ballrooms in Frankfurt at 600 m2. - This is an amazing opportunity for Scandic Hotels. Frankfurt is a major financial center and global commercial hub. We expect the new hotel to perform well on the market due to its many revenue streams and great location next to the ECB, says Michel Schutzbach, Country Manager Germany at Scandic Hotels Europe. - The hotel in Hafenpark is in line with Scandic’s strategy to expand in the largest cities in Germany. The addition of this second hotel in Frankfurt will not only raise awareness of Scandic, but also consolidate our presence in the German market, creating synergies with the Scandic Frankfurt Museumsufer that will open in February. The two hotels complement each other well and they will also boost our operating performance and market share, says Even Frydenberg, President & CEO, Scandic Hotels Group. - We believe that we in Scandic have found a perfect partner for this project. Scandic has a successful track record of operating large conference hotels and we’re very happy to have entered this agreement and looking forward to future projects together, says Thorsten Testorp, Managing partner at B&L Group. This is of high importance since Germany is the world leader in trade fairs and congresses. Around two-thirds of the world’s leading trade fairs take place in Germany and many of the biggest recurring events are held in Frankfurt. The city is the major financial center in Germany and Frankfurt Airport, which is one of the busiest in Europe, will be expanded to include a third terminal with capacity for 15 million travelers a year. The new terminal is expected to open in 2023. The agreement is subject to building permits. * The Certified Star Award from the German Business Travel Association (VDR). Scandic is the largest hotel company in the Nordic region with 15,000 team members and a network of close to 230 hotels with about 45,000 hotel rooms in operation and under development. Scandic Friends is the biggest loyalty program in the Nordic hotel sector with 2 million members. Corporate responsibility has always been a part of Scandic’s DNA and Scandic has been named Best Hotel Brand in the Nordic countries (BDRC). Since December 2, 2015, Scandic has been listed on Nasdaq Stockholm.